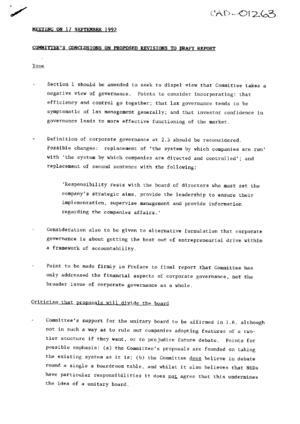 Cambridge Judge Business School : The Cadbury Archive : Meeting on 17 September 1992, Committee's conclusions on proposed revision to draft report. Meeting on 17 September 1992, Committee's conclusions on proposed revision to draft report. Covers all sections of the report with suggested replacement wording.